I’m tempted to say that OpenMW hasn’t changed all that much, but that wouldn’t be true. The changes are huge, but the nature of these changes are the same as those of last week. Let’s just say another mountain of bugs has been fixed. It’s worth pointing out that this “mountain” is quite high! We’re not talking Wetterhorn-size – it’s more like K2! But instead of getting caught up in analogies, let’s focus on the facts. The amount of fixed bugs are in the triple digits. 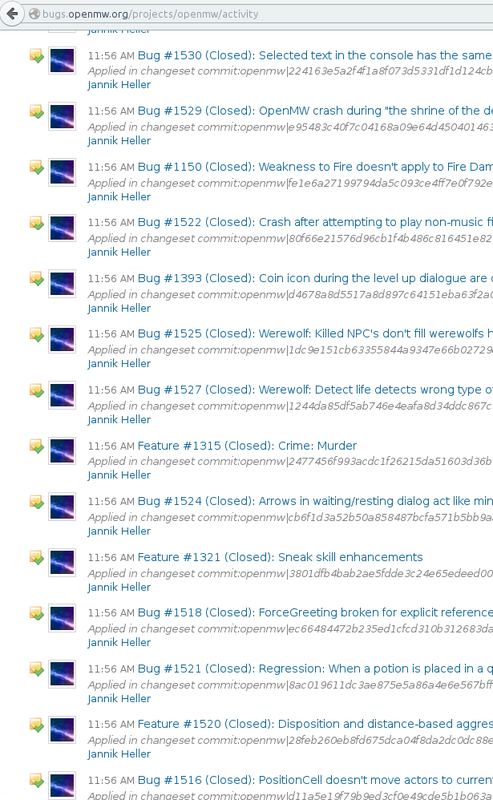 Seriously, check the bug tracker if you don’t believe me. The big bug brawler is Scrawl, but other developers, such as MrCheko, have also put in a lot of effort to reach this new high score. So what else? I’m afraid not too much. Work is being done on supporting nested data in OpenCS (eg. a list of what’s in an NPC’s inventory nested inside his/her properties window). It’s quite interesting because it makes finding these lists in OpenCS a lot more intuitive. It’s not finished yet, though.